North Korean school girls stop at a kiosk selling flowers on July 18, 2017, in Pyongyang, North Korea. Most North Korean workers earn between $2 and $3 per month. North Korea isn’t dismantling its nuclear arsenal overnight, but the meeting between United States President Donald Trump and North Korean leader Kim Jong Un on Tuesday in Singapore was nonetheless groundbreaking. It was the first time sitting heads of state from the two countries had ever met, and it brought about the possibility of a broader peace agreement that could ease tensions in the region and diminish the risk of nuclear war, according to the New York Times. Beyond the overtures of camaraderie and vigorous handshakes, however, a lot is riding on the negotiations for the people of North Korea, who live in one of the poorest countries in the world, lack basic human rights, and face widespread abuses. Many human rights groups were disappointed by Trump’s failure to bring up issues like slave labor, torture, and starvation during the summit, according to Voice of America. "We're talking here about one of the most repressive governments in the world, which the UN has found culpable in committing crimes against humanity against its own people — so pushing human rights off the summit table is neither responsible nor ethical," Phil Robertson of Human Rights Watch (HRW) told VOA. North Korea’s dictatorial regime has long subjected its people to brutal living conditions, according to the United Nations. In recent years, severe economic sanctions organized by the UN in response to the aggressive development of nuclear weapons have deepened poverty in the country. Most North Koreans live in extreme poverty, with workers earning between $2 and $3 per month, according to the Borgen Project, an anti-poverty organization. More than 18 million people throughout the country, including 1.3 million children, require food assistance to avoid malnutrition, according to the UN in a report on hunger in the country. Basic medical care, meanwhile, remains too expensive for most citizens. Prior to the most recent sanctions imposed on North Korea, the country had begun diversifying its economy and increasing trade with other countries, according to Quartz. If the sanctions are lifted, international trade could resume, potentially lifting living standards and reducing poverty in the country. That wouldn’t solve everything, though. North Koreans also face extreme human rights abuses. and being sentenced to life in a political prison camp. The UN estimates that up to 120,000 North Koreans are held in political prisons, where they are tortured, raped, starved, and forced to work without pay. More than 340 people were executed between 2011 and 2016. These issues were not discussed by Trump and Kim, according to the Times. But for the summit to be a lasting success, activists argue, improving the rights of ordinary North Koreans needs to be a focus, too. 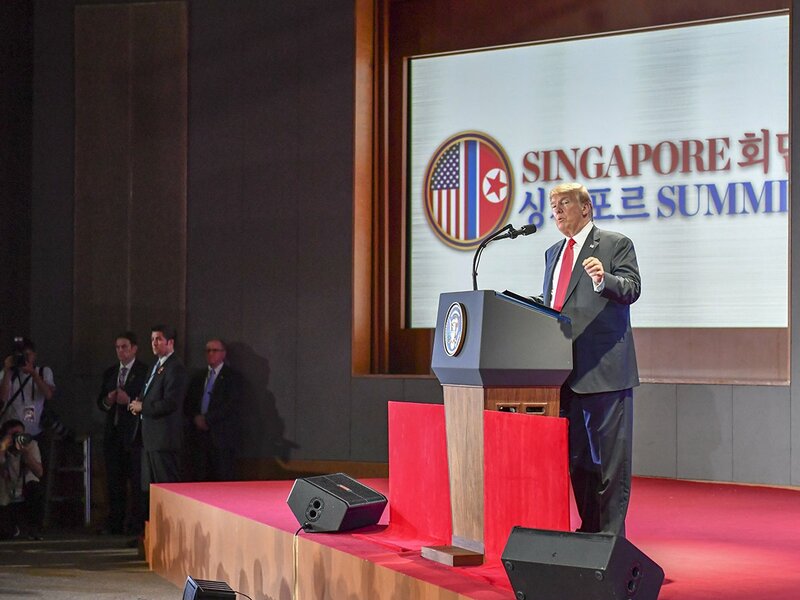 President Donald Trump addresses the press following the Singapore Summit in Singapore on June 12, 2018. Global Citizen campaigns to end extreme poverty, and you can take action on this issue here.